AAA State of Play Blog: Why install Recycled Rubber Mulch? Kids like to explore different play sets and run freely on the playground. This raises the risk of getting injured on the rough surface of the park. To prevent this, you can cover the playground with recycled rubber mulch. It provides proper cushioning surface and reduce the risk of probable injuries to kids. Post consumer material like cycle tubes, rubber pipes, van tires and other rubber products get recycled to produce recycled rubber mulch for the playground. In this recycling process, all the imperfections and other impurities are completely removed to obtain high quality rubber. Further, it gets de-vulcanized and shredded to acquire mulch. Recycled mulch has an added advantage over regular playground surfacing options. It is durable and impact resistant in nature. Moreover, it has high absorbing tendency and can easily absorb the moisture up to any amount, providing non-slippery surface to kids. The life expectancy of recycled rubber mulch is twice as long as regular playground surfaces. This mulch is totally bacteria free and does not allow the growth of weed as well as spread of rodent on the surface. All you need is mild soap and water to clean the recycled rubber mulch. As it is eco-friendly, Environmental Protection Agency (EPA) in the United States also supports the recycled rubber mulch. 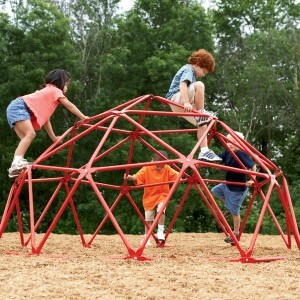 It is totally bacteria free and prevents the growth of weed & spread of rodent on the playground surface. You must install the rubber mulch beneath kids dome climber and see saw as such equipment has greater risk of falling to the ground.